Morris dancing could be "extinct" within 20 years because young people are too embarrassed to take part, a UK Morris association has warned. The number of people taking part in the English folk dance is falling while the average age of the dancers is going up. The Morris Ring, which represents 200 troupes, hopes a recruitment drive will revive the flagging tradition. "There is still time for new blood to get ready for the spring fertility offensive," said the ring's Paul Reece. 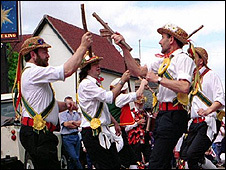 Morris dancing involves teams of dancers - often wearing hats and bells on their legs - wielding handkerchiefs, sticks or swords, to the accompaniment of folk music. It dates back centuries, though its origins are unclear. Charlie Corcoran, bagman of the Morris Ring, said: "There's a distinct possibility that in 20 years' time there will be nobody left. "This is a serious situation. The average age of Morris dancing sides is getting older and older. "Once we've lost this part of our culture, it will be almost impossible to revive it." The Morris Ring aims to encourage the performance of Morris dancing and maintain its traditions. It says there are more than 14,000 Morris dancers in the UK dancing for more than 800 sides. The association hopes younger people will join over the coming months in time for the main dancing season in the spring. Mr Reece, chairman of the ring's advisory council, said: "Such customs and activities were once a common sight around the country. "Today they are carried out by an ever-dwindling stalwart band of enthusiasts who are determined to keep them alive. Morris dancing for the Olympics?